A round selector that tries to give you the tools to select colors ramps efficiently. Set the color model used by the selector, as well as the amount of segments. Reset the selector to a default stage. This changes the algorithm around so it gives proper values for the gray. Without absolute, it’ll use HSV values for gray to the corresponding hue and lightness. the swatches to change the foreground color. 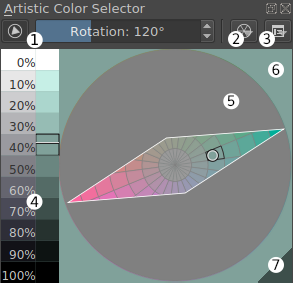 Use + Drag to shift the alignment of the selector swatches within a specific saturation ring. Use + Drag to shift the alignment of all swatches. This selector does not update on change of foreground color.